Pressure washing is one of the best ways to get your home perfectly clean and to get rid of stubborn dirt, cobwebs and grime that has accumulated over years in all of those hard to reach areas of your house. While pressure washing is perfectly safe in general you do need to be quite careful when using this cleaning method on old homes and buildings. Older homes have a lot of areas that have become quite fragile over the years. If the wrong pressure washing techniques are used on older buildings, you can easily end up damaging wood or other sensitive areas in your home’s structure. 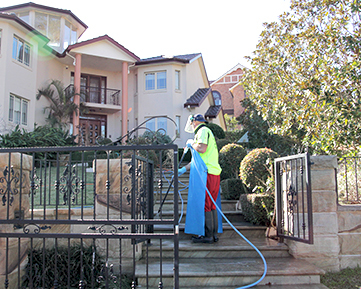 The best way to avoid damage to your home is by using experienced cleaners like Pressure Cleaning Sydney. But if you have your heart set on washing your home yourself then this quick pressure washing guide will help you get your older home perfectly clean without causing harm to the building. One of the biggest mistakes you can do is to get too close to the surface of the house with the pressure washer nozzle. When you get too close the pressure level is just too high for fragile areas like timber and painted surfaces to handle and the high-pressure water can start to peel the paint and damage the timber underneath. Put a 30cm distance between the nozzle and the surface of the house so you can prevent damaging sensitive areas. Plenty of modern commercial pressure washers have a pressure level that is way too harsh for sensitive building surfaces to handle. This high-pressure level is superb for cleaning tougher areas like driveways or for mechanical cleaning but for older buildings you shouldn’t venture beyond 1500 psi. This will prevent damage to softer structures like cladding and painted surfaces. By widening your nozzle stream you will reduce the force intensity of water and even the stream out. Widening your nozzle is also a great way to get your older home clean a lot quicker since you will be covering a much bigger area. This will also avoid forming a jet stream that might blow holes into your walls, rip through paint or tear out wood pieces. Vinegar is a natural product that is often used in cleaning and is superb for getting rid of mold and mildew. Simply grab a spray bottle with some vinegar and spray surfaces that need a bit of extra effort to get clean or surfaces with mold. Allow to sit for a while and rinse away with your pressure washer. Don’t use high water pressure levels or get too close to your nozzle on areas that are particularly stubborn. This will only cause damage. Instead, grab a sponge or rag and scrub stubborn dirt using a soap mixture. You can then rinse away with your pressure cleaner. Once you are done with washing you should allow the building to dry off properly before starting on repair jobs like painting. Allow 48 hours so your home will dry off properly so you can be sure of great adhesion especially when painting. With these tips, you can easily avoid damage to your old home and still get that spotless clean result.